hydroxide) (BET SO3-), and amine (2-(Methacryloyloxy) ethyl trimethylammonium chloride (N(CH3)3+)). The monomers were grafted using UV-induced polymerization on commercial poly (ether sulfone) membranes. Dr. Gadhamshetty is an Environmental Engineering Professor at the SD School of Mines and Technology (SDSM&T). He is a Board Certified Environmental Engineer (BCEE) and a licensed Professional Engineer (PE) from the state of NY. Dr. Gadhamshetty is a recipient of a National Science Foundation (NSF) CAREER award of CBET in 2015. Among many other awards, Dr. Gadhamshetty was the first recipient of SD Mines Research Award established in 2016 at SDSM&T. Dr. Gadhamshetty has at least 15 years of research or teaching experience from range of institutions including Du Pont, Rensselaer Polytechnic Institute, Florida Gulf Coast University, and SDSM&T. In the past ten years, he has emerged as an excellent teacher. Since joining SDSM&T in Fall 2014, he became an integral to several collaborative research projects. He is currently an investigator in ongoing research projects worth $3.5 M, and a lead Principal Investigator for the funded projects worth $2 M. His ongoing research projects aim to innovate environmental engineering discipline using cutting-edge concepts related to microbial-electrochemistry, flat coatings, and microbiology. The bulk of his research is being supported by Electric Power Research Institute, National Science Foundation, and National Aeronautics and Space Administration. His researches on generating electricity from defective tomatoes was featured in over 350 media outlets including BBC World Service, History Now, Newsday Radio talk, CNN, and Popular Science. 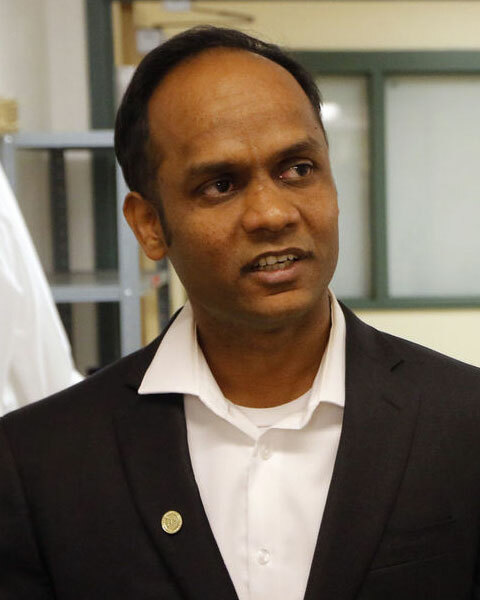 Bio: Dr. Gadhamshetty is an Environmental Engineering Professor at the SD School of Mines and Technology (SDSM&T). He is a Board Certified Environmental Engineer (BCEE) and a licensed Professional Engineer (PE) from the state of NY. Dr. Gadhamshetty is a recipient of a National Science Foundation (NSF) CAREER award of CBET in 2015. Among many other awards, Dr. Gadhamshetty was the first recipient of SD Mines Research Award established in 2016 at SDSM&T. Dr. Gadhamshetty has at least 15 years of research or teaching experience from range of institutions including Du Pont, Rensselaer Polytechnic Institute, Florida Gulf Coast University, and SDSM&T. In the past ten years, he has emerged as an excellent teacher. Since joining SDSM&T in Fall 2014, he became an integral to several collaborative research projects. He is currently an investigator in ongoing research projects worth $3.5 M, and a lead Principal Investigator for the funded projects worth $2 M. His ongoing research projects aim to innovate environmental engineering discipline using cutting-edge concepts related to microbial-electrochemistry, flat coatings, and microbiology. The bulk of his research is being supported by Electric Power Research Institute, National Science Foundation, and National Aeronautics and Space Administration. His researches on generating electricity from defective tomatoes was featured in over 350 media outlets including BBC World Service, History Now, Newsday Radio talk, CNN, and Popular Science.